I was driving home from work today and listening to a “throwback” workout station on Spotify. And when I say throw back the songs were from about 7 years ago?!? I don’t know… Anyways, I was thinking about how I was going to come home and do some yoga and then I had a brilliant idea! I am going to do yoga but to some hip hop music!!! I. Am. A. Genius! What got me going was a song by Usher. Sometimes I try to be a professional dancer in my car on my commute to or from work ;D Remember that car commercial with the woman dancing in the front passenger seat?! Eh hem… that’s me! Hahaha..I wish! How often do you guys change up your workout routine? I get bored very easily if I do the same workout several times in a row. I am constantly switching it up. I had to give up running the bleachers as of late because of awful shin splints in my right shin. Today at work I was sitting at the nurses station and all of a sudden I had very sharp pains shoot up my right shin. Gosh it was PAINFUL! The physical therapist at work told me that I need to stretch more and lay off the high impact cardio for a little while. Ugh… I am going on a backpacking trip in a week so I hope to be back up to speed by then. 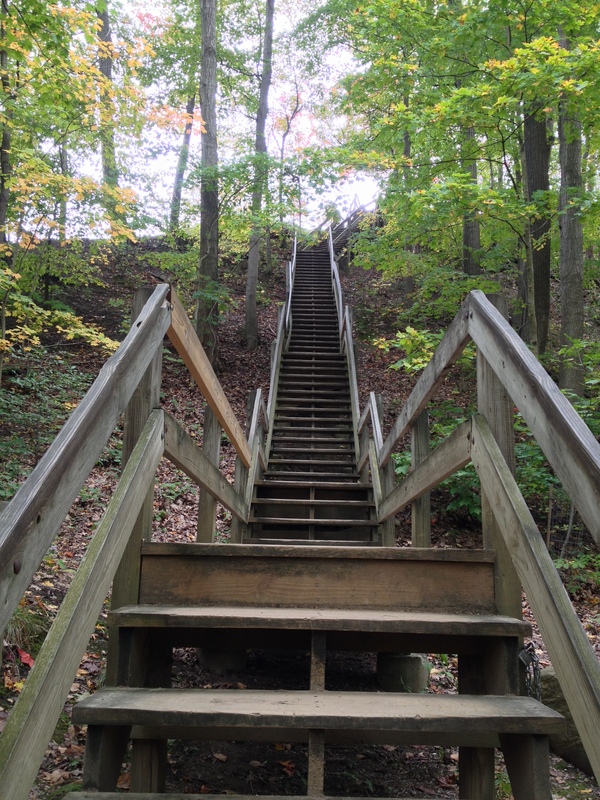 Yesterday a friend and I went to the park and climbed the stairs behind the nature center. My friend is very toned and muscular as he spends a lot of time in the gym lifting weights. However, I can out do him when it comes to cardio any day! He texted me today to tell me that he was soooo sore. Poor baby! So I asked him if he would put me through a killer upper body workout. I am great with cardio. Not so great at being consistent with weights…especially my upper body. And this dude has some sweet arms so I trust that the workout he puts me through will be awesome and a good hurt! What are some of your favorite upper body workouts? Find alternative ways to exercise and rocking out to Journey! Hello everyone! I hope you all had a great weekend 😀 This will be a quick little sweet post! Annnnnnyways…. I have been sustaining minor injuries from over use and improper warm up. I know better but hey when you feel good you feel good and you push your body a little harder. Enter in shin splints in my right shin, a slightly pulled muscle in my right quad and a still sensitive sprained left ankle. What the HECK dude?!?! I am a competitive person. Especially with myself. So I was chillaxing at home and wondering what the heck I was going to do for cardio and strength training while giving my lower body a rest from high impact cardio. Ugh…I can’t tell you the last time I have been to the rock gym! Totally depressed about that one…with my ankle still being sore and sensitive I cannot jump down from bouldering problems. So I decided to pull out my yoga mat and do more than just the normal routine of awesome stretches. It has been a while since I have attended an actual yoga class on a regular basis. I used to go all the time when I lived in Southern California. In L.A. you could go to a yoga class pretty much anytime of day, even midnight. I loved it! Now that I am back in Ohio it is a little harder as the studios are more spread out, the schedules aren’t really that conducive and the variety of yoga just isn’t there. Well not as much as SoCal. So I decided to take matters into my own hands and YouTube the crap out of online yoga! Benefits? Free and I can do it in my own home. Sounds pretty good to me. Except I get bored at home and generally dislike working out at home. 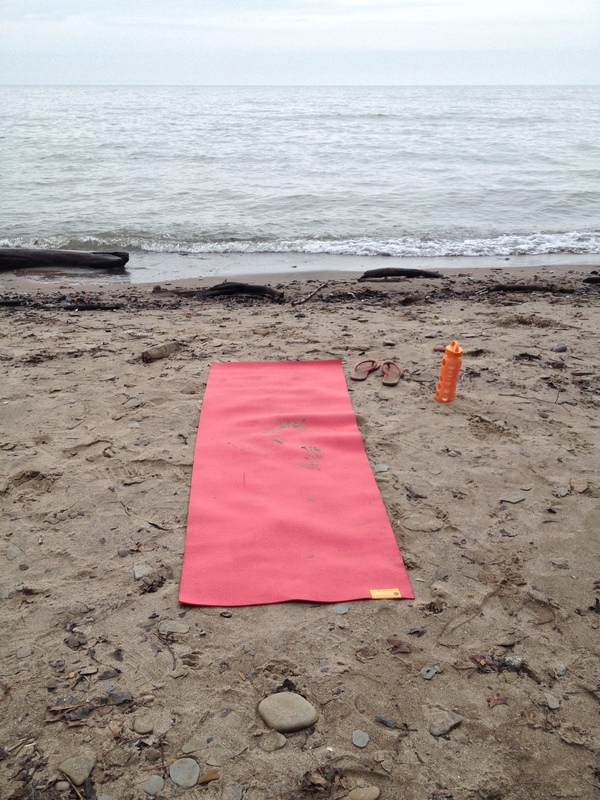 And since I am problem solver..hahaha…I took my mat outdoors. 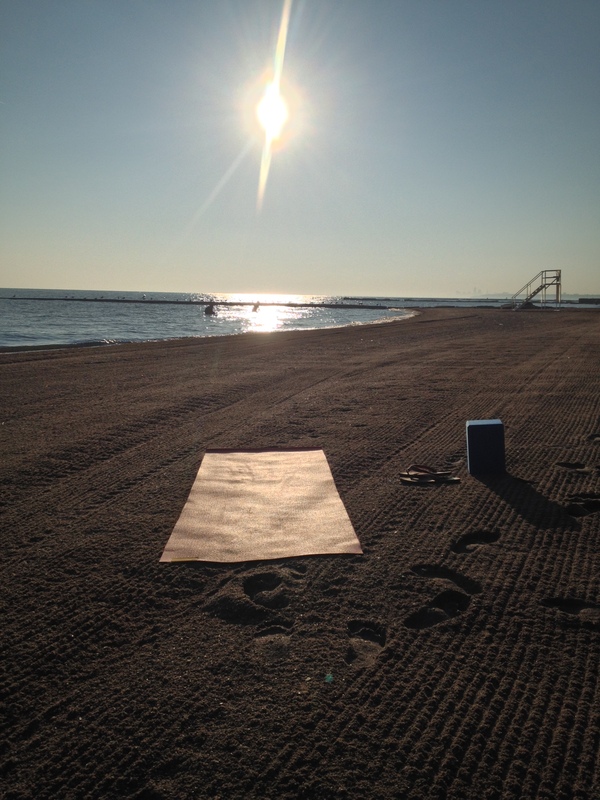 I would say 4 out of 7 mornings you can find me at a local beach or grassy park running through various yoga poses. 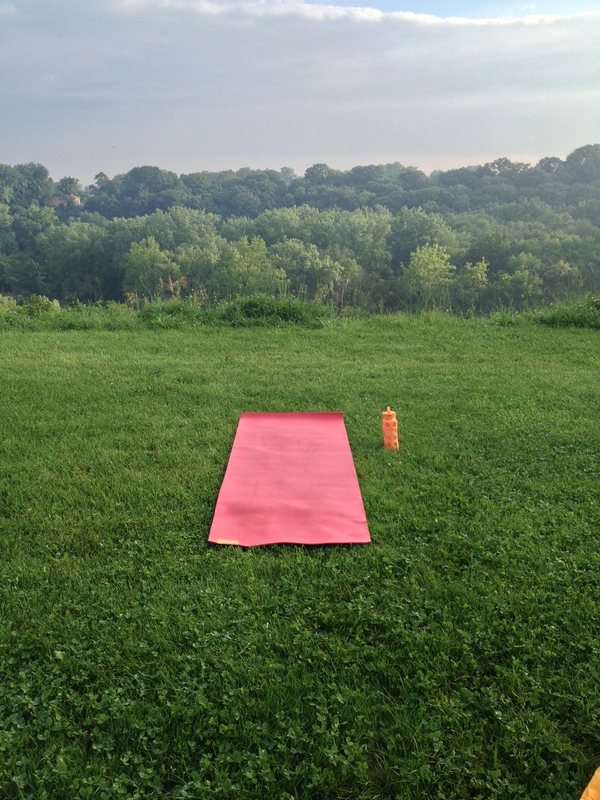 Yoga on the hill top! I feel so much stronger than I did a week ago! Especially in my shoulders which are a tough spot for me to train. Before I head out the door I look up new poses and/or poses for what body parts I am struggling with. It is so easy to do and the benefits are amazing. I know I am walking taller and straighter too! Now I just need another yoga mat. One for indoors and one for outdoors. As I was driving home from work this evening (Sunday as I am writing this) I was flipping through the stations on the radio and Journey’s Don’t Stop Believin’ came on. I was totally dancing, singing and rocking out on the highway home. After it was over I found it playing on ANOTHER station. I mean the universe wanted an encore of my first performance right?!?!?!!! I gladly obliged and rocked out aaagain! I didn’t care who watching me as the passed me by. I was having too much fun! I almost forgot to mention how AWESOME SAUCE I sounded!!! Move over Steve Perry!!! Peace out til next time and namaste dudes!